Pruitt's spending on security is among the subjects of more than a dozen federal probes involving the EPA. WASHINGTON — Two top aides have resigned from the Environmental Protection Agency amid a growing series of federal ethics investigations, EPA chief Scott Pruitt announced Tuesday. In statements, Pruitt gave no immediate reasons why the aides — security chief Pasquale "Nino" Perrotta and Superfund manager Albert Kelly — were leaving. EPA spokespeople Jahan Wilcox and Liz Bowman did not immediately respond to questions about whether the departures were related to ongoing federal investigations. Pruitt's spending on security, and some of the security contracts with Perrotta, are among the subjects of more than a dozen federal probes involving the EPA under Pruitt, a former Oklahoma attorney general. Pruitt said Perrotta was retiring, and praised what he described as Perrotta's hard work and dedication. 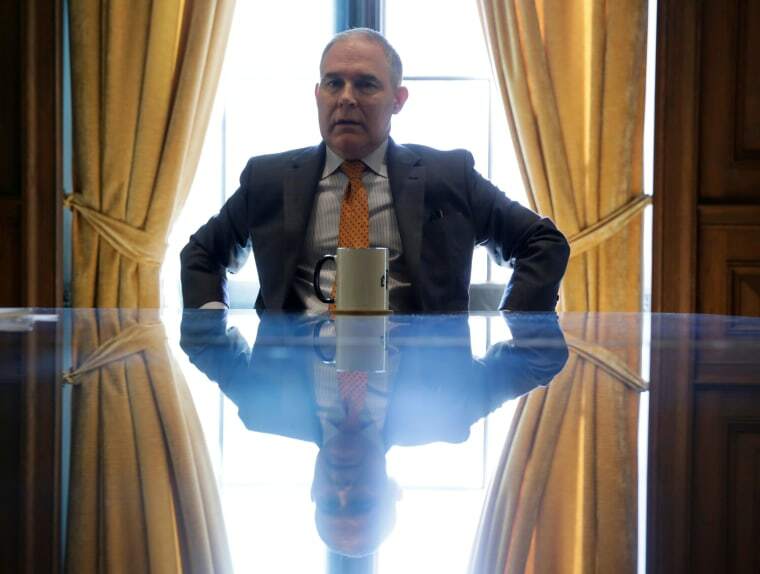 Pruitt hired Kelly, an Oklahoma banker, at EPA after federal banking regulators had banned him from banking for life over unspecified lending matters. Democrats in Congress last month asked for federal investigations of Kelly's reported loans to Pruitt himself while the two were still in Oklahoma. Last week, Pruitt weathered six hours of grilling from congressional Democrats over the steady flow of news reports and announcements of new investigations involving alleged ethical lapses at his agency, including spending for round-the-clock security guards, first-class plane tickets and a $43,000 soundproof telephone booth. Pruitt repeatedly deflected blame, saying subordinates had taken the questioned actions without his knowledge. Rep. Don Beyer, D-Va., who has pushed for investigations of ethical problems under Pruitt, said in a statement Tuesday that "Pruitt should be the next to go." "Albert Kelly was never qualified to run Superfund, his banking ban was a huge red flag and his resignation is a positive development," Beyer said.